Mobile Aisle systems allow you to collapse the space between rows of shelving, freeing existing floor space for other uses. Shelving uses a V-grip locking system increasing overall shelf capacity while presenting a smooth, solid shelf front, and is able to accept all other V-Grip shelving and rack components to maximize space for small parts and bulk items. Comes standard in gray color. Includes limited lifetime manufacturer warranty. 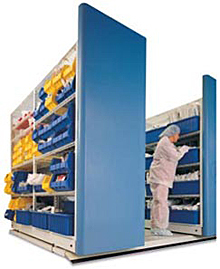 Industrial applications, tool cribs, offices, museums, legal firms, and medical records applications are all possible with mobile aisle technology. Wherever space is at a premium you have opportunities to optimize with space-saving mobile aisle systems. Mechanical assisted system utilizes a drive shaft/gear chain arrangement to permit easy movement of heavyweight loads up to 10,000 lbs. Carriages are operated mechanically by means of an exclusive ergonomically designed hand wheel which prevents snagging clothing. It requires less strength and energy to operate - as easy to turn as the power steering in your car. Carriages are operated manually by means of a handhold at the end of each row. All-track drives assure uniform movement of carriages. Rated to carry up to 1000 lbs. per linear foot maximum load. For assistance on your mobile aisle shelving system, contact Cisco-Eagle. We can help you design a system to meet your storage needs. 10 rows of shelving in the same space that 6 rows of conventional shelving occupied. This layout saves 40% floor space. V-Grip and drawer combination (by Equipto) organizes in 3 rows what usually takes 6. Cut wasted space by 70%. A Mezzanine can increase total floor space by 170%.